What is the geology behind the 250MMboe gas discovery in the UK North Sea and what about follow-up potential? The exciting news of yesterday was the significant discovery in the Glengorm exploration well offshore UK. Operator CNOOC and partners announced a 250MMboe gas and condensate discovery in block 22/21c-13 in the Central Graben (read also “Discovery in UK North Sea”). The OGA commented that it might be the biggest gas find since Culzean and is pleased that exploration companies are taking a fresh look at “old” prospects with success. 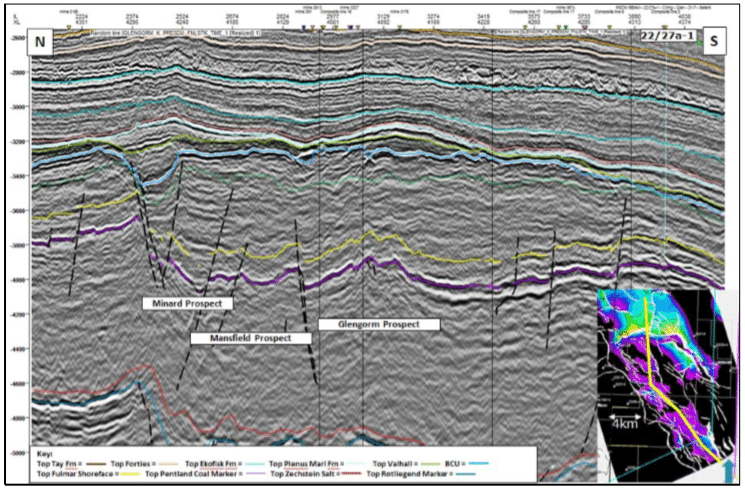 Let’s have a closer look at the geology of the Glengorm discovery and the follow-up potential. 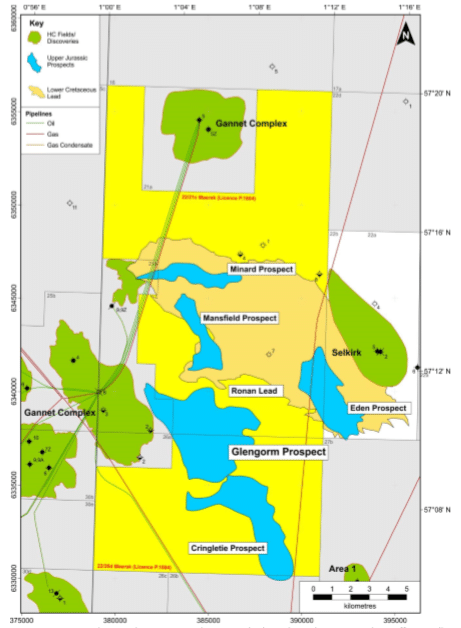 The acreage around Glengorm was held by Maersk Oil before and released due to failure to de-risk top seal integrity for the HPHT Upper Jurassic prospects. 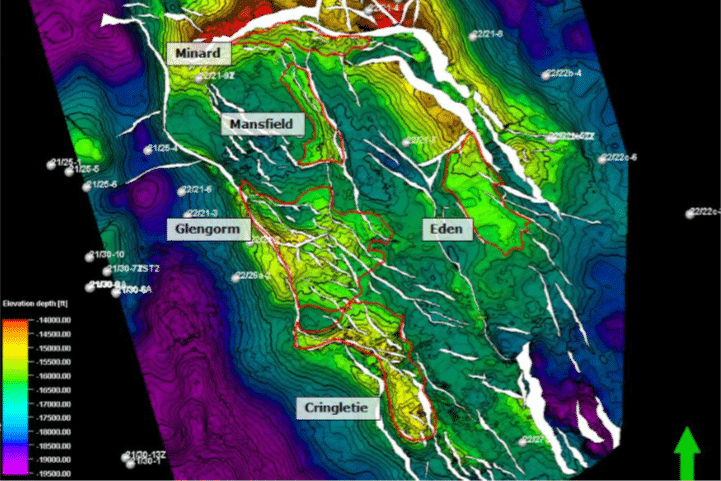 Prospectivity, mapped out by Maersk Oil consists of a series of Upper Jurassic prospects (Glengorm, Cringletie, Mansfield, Minard & Eden) with stacked reservoirs in the deep marine, Intra-Heather formation turbidites and the shallow marine shoreface deposits of the Fulmar formation. Upside potential is present within the Lower Cretaceous Kopervik age equivalent mass flow sands (Ronan lead). The Jurassic prospects are all structural traps with an element of fault seal. 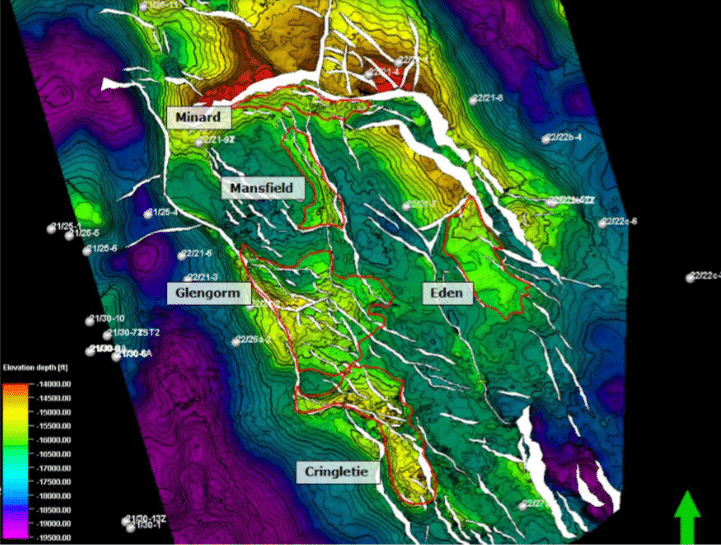 The structural closures could be mapped on the Top Pentland level (see depth map), a proxy for the top reservoir (Fulmar sands) which was difficult to map out over the area due to a low acoustic impedance contrast with the overlying shales. Glengorm is a fault-bounded structural trap with dip closure in 3 directions. The main risk pre-drill of Glengorm was associated with the top seal because of the presence of blown/leaky traps (22/21-7, 22/27a-1 & 22/27a-2 exploration wells) in the area. Maersk Oil considered this risk as too high and consequently released the license again. Now it is evident that the top seal of Glengorm was intact and hydrocarbons have been preserved in the trap. This derisks the other Jurassic prospects as they have similar traps, same reservoir and are located at similar depths/pressures. In conclusion it looks like there is great follow-up potential in the area with substantial undiscovered volumes. Seismic strike line over the Glengorm discovery, also highlighting the Mansfield horst block & downthrown Minard trap to the north of the line. Seismic displayed is the PSDM Kirchhoff product (in TWT). Figure Maersk Oil. Read the full relinquishment report here.